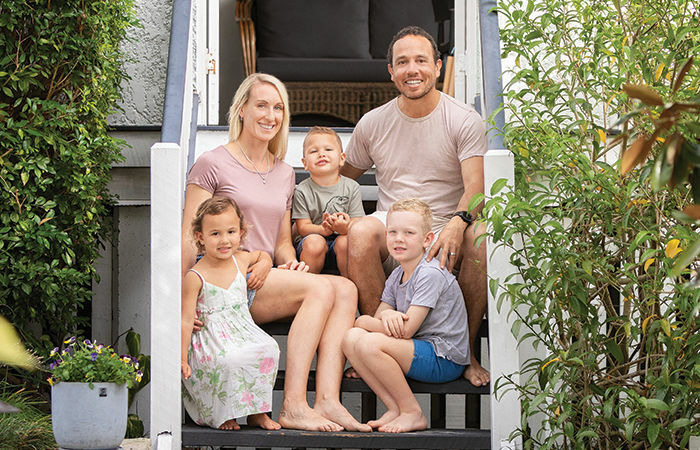 If you’re buying or building your first home in Queensland, you may be eligible for the $15,000 first home buyers grant. Read on to learn what you need to do and how we help you apply for it. At Blackk, we have a special focus on helping first-time home buyers like you get into your first home. Unsurprisingly, that means we’re often asked about the first home buyers’ grant. We’ve been helping clients get their first home owners grant approved for over 10 years and so far we’ve had a 100% success rate in getting clients paid their grant! So we’ve put together this post to explain the most commonly asked questions so you have everything you need to know about this initiative – and why you need to get in fast to take full advantage of it. We had the chance to talk about this with Channel Nine News and it was great to show how the grant has helped some of our clients! How do I get the $15,000 building grant? You are eligible to apply for the $15,000 building grant if you’ve never owned a property, and you’re either ‘building’ or ‘buying a brand new home’ in the sunshine state. The $15,000 building grant (also known by its official name, Queensland first home buyers grant) is a state sponsored one-off payment designed to go towards the cost of your new home. This post is for those buying or building a brand new home, however, if your buying an already established home you may be eligible for a saving on the stamp duty payable. I have also created a free training video online, which goes through how to apply for the building grant which can be accessed here. 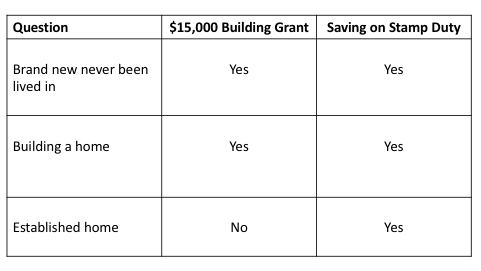 Table 1: Quick answers to the top 3 questions about the building grant. Why is the building grant no longer $20,000? The $20,000 Queensland first home buyers’ grant was only available until midnight on 30 June 2018 for first-time homeowners who sign a contract to purchase a brand new home or sign a contract to with a builder to build a home between 1 July 2016 and midnight 30 June 2018. If you’re buying a brand new home, the property does not need to have settled by midnight on 30 June 2018, you just need to have signed the contract. After this date, the grant reverted back to the original $15,000 one-off payment. Keep an eye on this page for updates. What grants and rebates am I eligible for as a first time home builder? What you can get from the Queensland government depends on the type of property you’re buying or building. 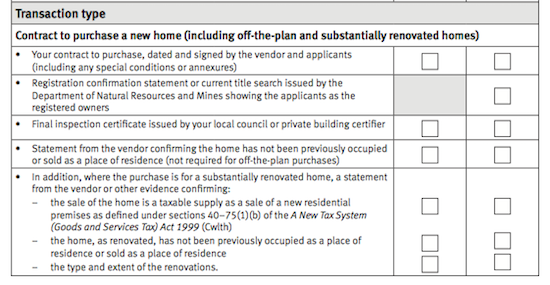 If you’re building a new home in Queensland, you are probably eligible for the building grant ($15,000) and the stamp duty rebate on the vacant land you buy. If you’re buying a home “off the plan” or buying a brand new home that’s never been lived in before, you should be eligible for the $15,000 first home buyers’ grant and the saving on the stamp duty. I think we can probably agree this is pretty amazing! If you’re a first-time homeowner buying an established home you’re eligible for the saving on the stamp duty only. 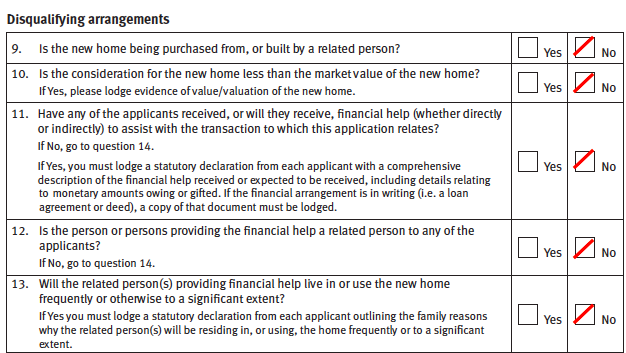 Table 2: What might I be eligible for based on the type of home? 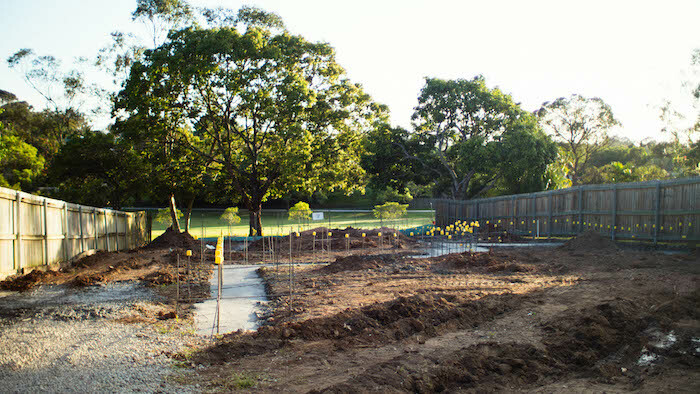 Use the Queensland first home owners grant to kickstart building your first home (pic – vacant land in Brisbane). What do you need to do to qualify for the full $15,000? To qualify for the $15,000 building grant, you (and your partner or spouse) must meet several criteria which we’ll talk about specifically. 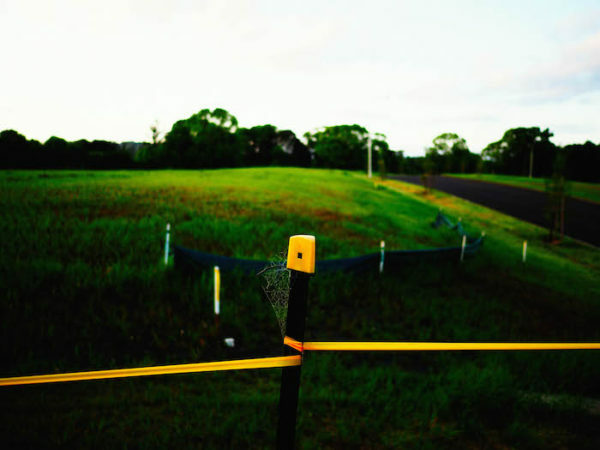 Purchase a block of land which must be done before you sign a building contract. (To learn more about building, read how to build a home step by step guide. Sign a building contract for your new home. At the moment there is no date for when the $15,000 grant will end. Keep an eye on this page for updates. 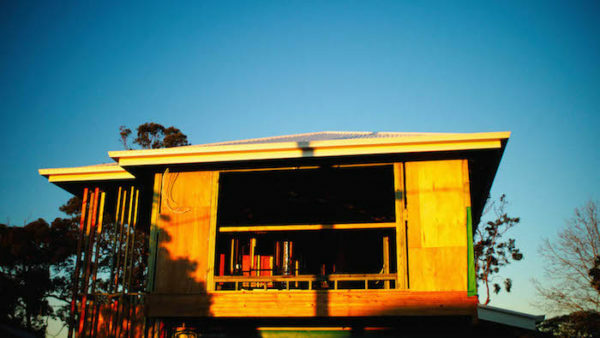 Get in touch to check what you need to do so you can apply for the full grant (pic – home under construction around Brisbane). Can you use your $15,000 grant for your home loan deposit? We definitely recommend that you factor your $15,000 grant into your calculations. Typically, the grant helps people like you buy or build your new home sooner – or it gives you more of a buffer to do so. Nearly everyone who is buying or building their first home needs to take out a loan, as they don’t have the money saved to buy the land and pay for the building outright. When you’re building, this is often called either a building or construction loan. You can use your $15,000 Queensland First Home Owners’ Grant as all or part of your deposit when you apply for the building portion of your construction loan or mortgage (the stamp duty rebate is paid on the cost of the land). Of course, if you’re building, there are additional things to consider, such as the timing for when you get access to your grant and when you need to pay your deposit to your builder in order to get started. 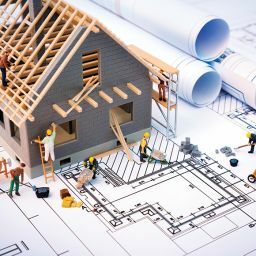 Typically in most situations, you pay the builder a 5% deposit upfront to get started, which covers the cost of the building appraisal, council approval, working drawings, council fees, application fees, QBCC fees and insurance. If you’d like to talk about your home loan and first home buyers grant application in more detail, you can book online now, either a phone call or face to face meeting. There is no cost for this consultation. Victor talking to first home buyers (pic – at our offices in Holland Park, Brisbane). When is your grant paid? The $15,000 first home buyers’ grant is paid at different times depending both on how and when you applied for it, and on what type of property you’re building or buying. 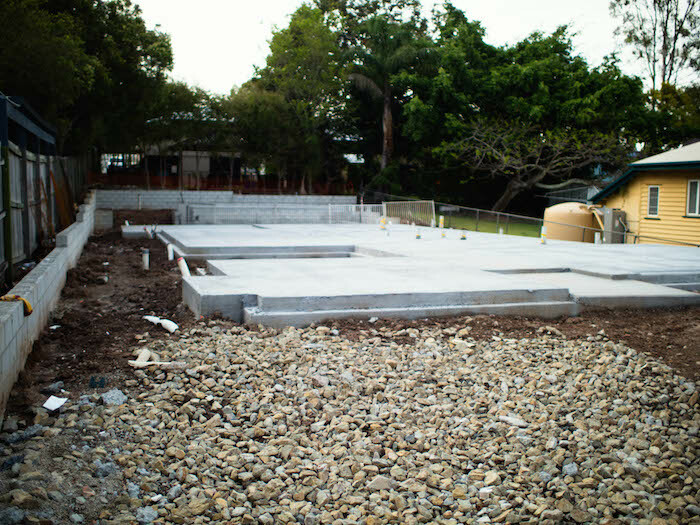 If you’re like most of our first-time homeowner clients who come to us, you’ll receive your grant at the “slab stage” (when your builder pours the slab for your new home – see more about the steps to build your home). The grant will, therefore, be part of the second payment that’s made to your builder, as you will have already paid them a deposit (normally 5%) prior to getting started. The Queensland Office of State Revenue transfers your $15,000 to your lender, and your bank will then pay the builder on your behalf. In other words, the money won’t go directly into your bank account – it’s passed straight onto your builder. If you’re buying “off the plan”, you’ll receive your $15,000 grant at the settlement of your home. Once again, the processing of your first home buyers’ grant is handled by your lender. This is by far the quickest and most convenient way to have your grant paid and once again it becomes a part of your deposit. In our experience, it’s faster to have the grant handled by ourselves and your lender, which usually takes three to four business days before. In contrast, applying directly through the Office of State Revenue yourself usually takes at least three weeks or more to process your grant payment. The grant is paid at different times depending on what you are buying (pic – getting ready for building around the local Brisbane area). 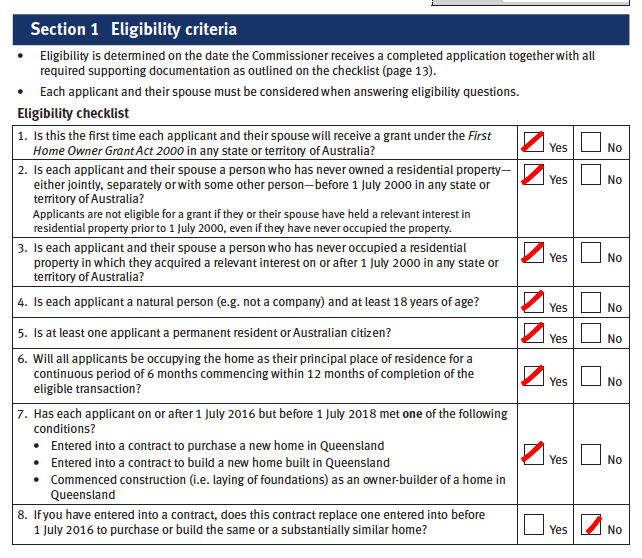 What other rules apply to be eligible for the $15,000 first home buyers grant? As we mentioned earlier, you must meet several eligibility criteria in order to successfully apply for the full $15,000 grant. This includes rules about the type of property you’re purchasing, your age and residency status, and whether or not you’ve received this grant (or a similar one) previously. The first home buyers’ grant is to help people like you purchase your first home. This means you must not have previously owned or part-owned any property in your personal name. ** A substantially renovated home is a home that’s been almost completely knocked down and then fully rebuilt. This home must be renovated BEFORE you buy it – you can’t buy a home and then renovate it yourself. To qualify for the grant on a substantially renovated home, you must also provide the Queensland Office of State Revenue with a final inspection certificate – a form 11 if your new home is a unit, or a form 21 if your new home is a house. To be eligible for the $15,000 first home buyers’ grant, the total purchase price of your property must be less than $750,000. If you’re buying “off the plan” or buying a newly built property, determining your purchase price is simple. It’s the total price that was on your contract. If you’re building your first home, the total purchase price will be the cost of your land plus the cost of the building contract, plus any additional construction costs (features or items such as fences, landscaping, or solar panels). So, for example, if you buy a block of land for $379,000, sign a building contract for $298,900, and pay for fencing, landscaping, and a driveway for $31,400, then your total purchase price will be $709,300. Another key criterion is home occupancy. To receive the $15,000 grant, you must live in your new home for at least six consecutive months, commencing within 12 months of your purchase date. If you fail to do this, you will need to pay back part or all of your grant. You may also be charged a penalty. Another key requirement for receiving the first home buyers’ grant is that you must be at least 18 years old on the date of purchase. You must also be an Australian citizen or permanent resident – or, if you’re buying your first home together, then you OR your partner or spouse must be an Australian citizen or permanent resident. The final eligibility criterion for the Queensland First Home Owners’ Grant is that you must not have previously received a first home buyer grant in any Australian state or territory. If you’re buying with your partner or spouse, they must not have received the Queensland grant or an equivalent grant in any other Australian state either. 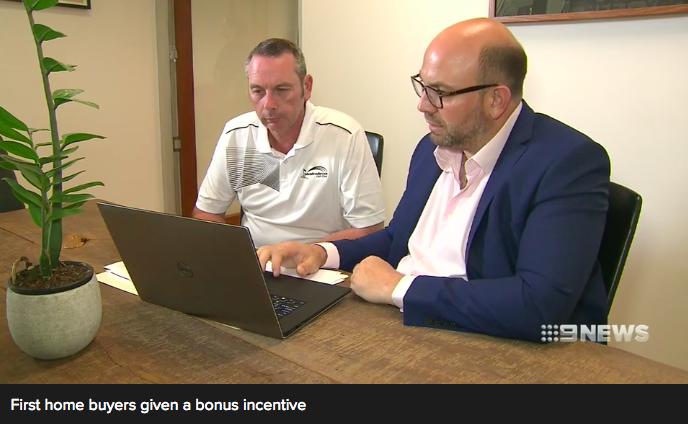 Victor talking to a client about the building grant on Channel Nine News (Pic – at our offices in Holland Park, Brisbane). It’s very important to understand the status of your relationship as seen by the Queensland Office of State Revenue. In their eyes, under the Act, you are “partners” if you have been together as a couple for two or more years. This timeframe is significant, because it may impact whether or not you are eligible for the $15,000 grant. For example, we recently worked with two clients that we’ll call Michael and Genevieve (not their real names). Michael and Genevieve started their relationship less than 15 months ago. Things were going well and they had decided it was time to build a home together. Genevieve already owned a property that she was living it, but she and Michael planned to rent it out and live together in the new home Michael was building. 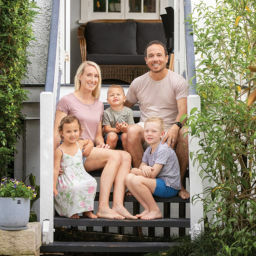 Because Michael hadn’t owned a home before and their relationship had not yet reached the two year mark, he was eligible to apply for the grant because Genevieve didn’t meet the government’s relationship test of being together for more than two years. This meant Michael and Genevieve could still apply for their home loan together in joint names because the bank considered them to be domestic partners, but the ownership and title of the property was solely in Michael’s name, allowing him to qualify for the grant. Obviously, this doesn’t apply to everyone, but it’s important to be aware of it in case you’re in a similar situation and didn’t realise that you may still be eligible for $15,000 to help with your deposit. If you get a home loan through us, we’ll help you complete the application for your $15,000 grant and then lodge it with any necessary supporting paperwork on your behalf. The necessary supporting paperwork will vary depending on your circumstances and situation, but it may include items such as your contract of sale or build contract and proof of identity. We can advise you on everything you need and help you organise it so your grant application is as hassle-free as possible. We also make sure everything’s done quickly and correctly so you get your grant money sooner. This won’t cost you a cent as we are paid commission from the bank that you choose to get your home loan approved with. As a part of our service, we handle the application and approval of both your home loan and first home buyers grant application. Using us for these services won’t affect your home loan interest rate or add on any extra fees and charges (so you have nothing to lose)! Slab stage (Pic – local Brisbane area). 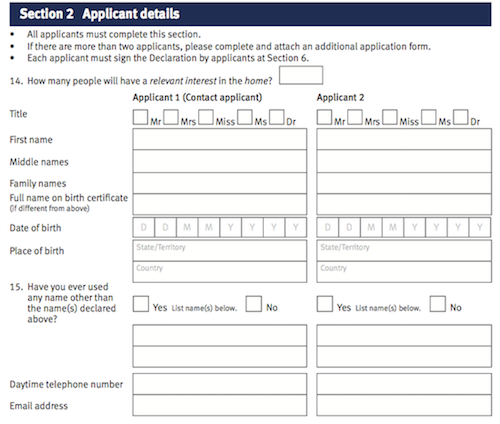 What’s in the application form? If you come to us for the home loan, then at Blackk we’ll complete the application form on your behalf. We fill the application form out at the point where your loan has been approved and you’re signing the loan paperwork from the bank. We’ll also need you to provide us with some additional paperwork. Some of it we already have from your home loan application and we’ll usually need a bit more. This section involves a simple checklist of Yes / No questions to verify your eligibility to receive the grant. To be eligible, you must be able to mark “yes” for questions one through to seven and “no” for questions eight through to thirteen. This is your usual name, address, contact details, date of birth stuff that you’ve filled in a million times before, so it shouldn’t be too hard. There is space for two applicants here (e.g. you and your partner / spouse). If for some reason there are more than 2 applicants (for example, you’re buying a home with your two siblings), you will need to attach an additional application form. In the fourth section you need to include your property address and indicate whether you’re building a new home, buying “off the plan”, or purchasing a new or substantially renovated home. Only fill in this section if you are of Aboriginal or Torres Strait Islander descent. This is the part where you sign and provide your bank details so the government has the information they need to pay the grant to your lender. Your signature must be witnessed by someone who isn’t an applicant. In other words, if you and your partner or spouse are both applicants, they can’t witness your signature. As you’re filling in the application form with us, we can be your signature witness. If you’re applying with your partner or spouse, this is the bit where they sign. Once again, their signature must be witnessed by someone who isn’t an applicant – like us. The exact requirements will vary somewhat depending on your situation, but you will always need to provide ID documents plus the paperwork for your land and building contracts or purchase contract. The additional documents we require can be your birth certificate, marriage certificate, passport and proof of citizenship. 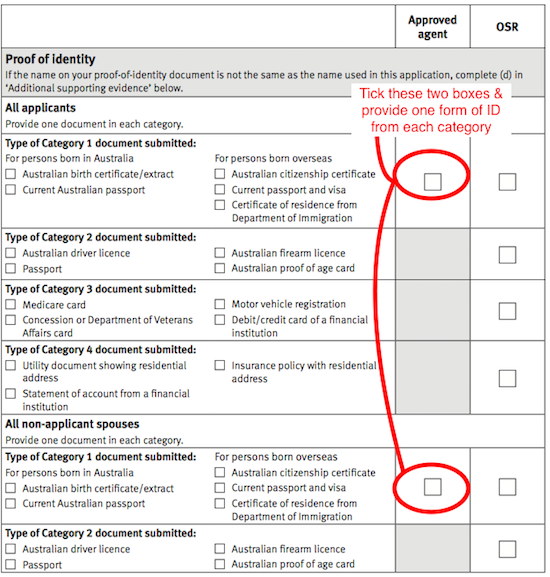 As we’re completing your application for you, the only ID you’ll require is one document from “Category 1” (circled in red below) for yourself, and one for your partner or spouse if you’re applying with them. These documents must be copied and witnessed by a Justice of the Peace (JP) or Commissioner of Declarations. This can be done in our office, or, if it’s more convenient, many Court Houses and even Libraries offer a free JP or Commissioner of Declarations service. If you have a “non-applicant spouse” (think Genevieve from our story earlier), they will also need to provide ID in the second half of this section (circled in red below). 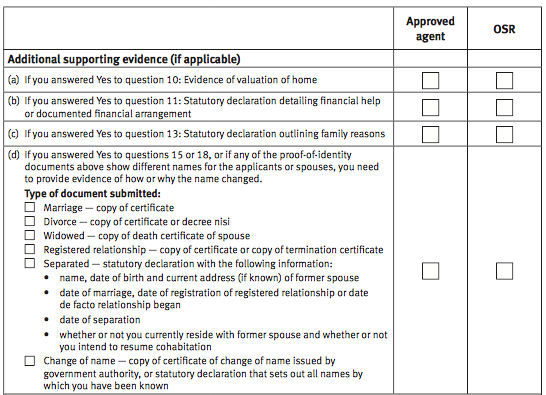 This section only applies under certain circumstances, such as explaining why your name may be different on various documents due to a name change, marriage, or divorce. We will take the time to help you determine whether you need to fill this section out or not. 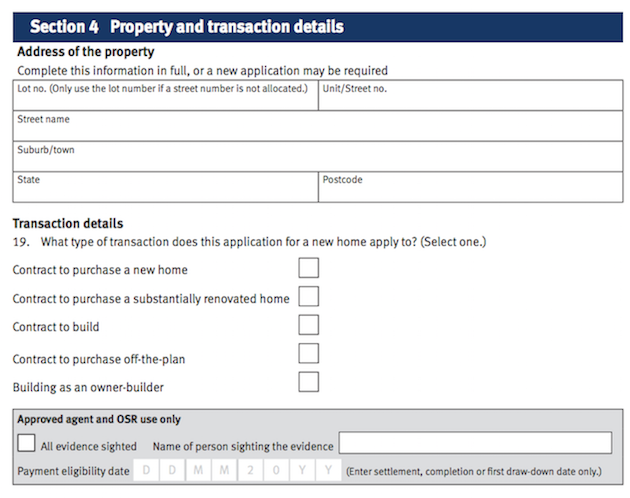 In this part of your application, you need to provide a copy of your building contract or purchase contract and any other associated documents that prove you are buying or building a home that meets the eligibility criteria. If you’re purchasing a new home (including “off the plan” properties), you must provide the signed and dated contract plus a final inspection certificate and a statement from the vendor that confirms the home has not been previously occupied. We should already have these documents on file from your home loan application. If you’re building your first home, you must provide a “contract to build” which has been dated and signed by your builder and all your applicants. You must also provide one additional item that shows the value of the land. 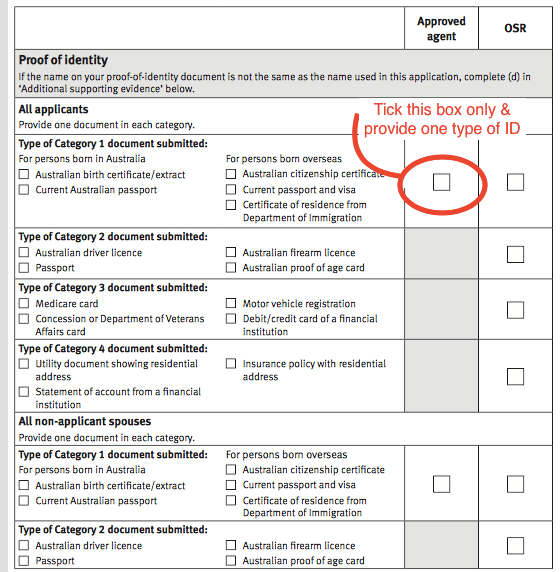 You can choose from the list of acceptable items on the application form. Again we will already have this documentation on file. What happens if I don’t follow the rules? 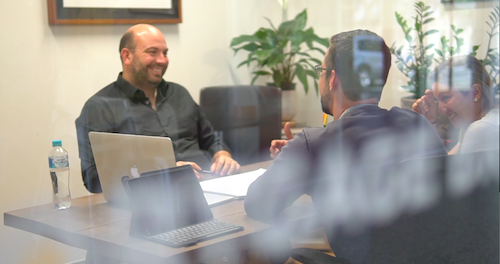 It’s worth knowing that the Queensland Office of State Revenue regularly audits grant applications to ensure that you have complied with their requirements. This is hardly surprising – they don’t take the idea of giving you $15,000 for free lightly! If you’re found to have failed to comply with the requirements for receiving the grant, you’ll most likely need to pay back your grant along with any additional penalties or fines that the office imposes upon you. As such, it pays to get things right, and if you’re not sure if you’re eligible for the first home buyers’ grant, ask us! If you’re looking to buy or build your first home with the Queensland First Home Owners’ Grant, Blackk can help. I’m Victor Kalinowski and I help first-time home buyers like you build your first home. As part of this service, I walk you through all the necessary steps to complete your first home buyers’ grant application. If you’re building your first home, I’ll also talk you through the building process so you can understand what’s going on. 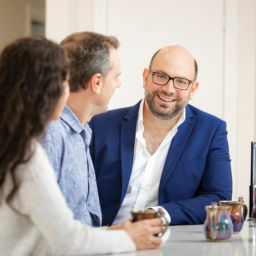 And because I believe in providing you with a thorough mortgage broking service, once you’ve got your mortgage sorted, I take the time to sit down with you and create a tailored plan that will help you pay off your mortgage sooner. You may already know that it costs you nothing to use our services as we’re paid by the lender when your loan settles. To discuss getting a loan to buy or build your first home, book yourself into my calendar here today. There is no cost for this consultation and no obligation to use us. You can also email me anytime or call me on 07 3122 3628 Monday to Friday to discuss. I look forward to speaking with you over the phone or at our Holland Park office soon! The information contained within this page is general in nature. It serves as a guide only and does not take into account your personal financial needs. Before you act on this information you should seek independent legal and financial advice. Copyright Blackk Finance 2019.